Like its predecessor, Tippett’s second symphony is in four movements, each of which, still in his post-war dedication to expressions of jubilation and renewal, the composer linked to a specific state: joy, tenderness, gaiety, and fantasy. The symphony is a work on the cusp, full of the rhythmic exuberance and lushly scored exultation of sound worlds he had made his own in The Midsummer Marriage, but already taut with the harder-edged building blocks of forthcoming works such as his second opera, King Priam (1958–61). Listening to a passage of Vivaldi with pounding Cs in the bass marked for Tippett ‘the exact moment of conception of the second symphony’. And so, in the first movement, the first subject bursts into life with a thump of quavers on a low C (given a percussive sheen by the addition of a piano). Gyrating strings then romp in above, resolutely accented on the ‘wrong’ beat. 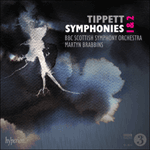 As so often in Tippett, the achievement is that such seeming missteps make the music dance rather than limp. A second subject is introduced, of graceful, elegiac woodwind, polished to a sugar-plum-fairy sparkle by the celesta. The two subjects are spliced and intercut within an overall sonata-form framework, and build the dialogue of contrasts inherent to so much of Tippett’s music, the friction between them providing inexorable momentum, cast each as you will: man and woman, earth and heaven, body and soul, shadow and light.